David Levine’s class visited two extremely different and unique plays in Berlin. The first one was Nach Moskou and the other one was Othello. Both the visits were arranged as a part of the class “Acting and Authenticity.” The actors/students were to study the acting skills and discuss what exactly they understood by acting. Questions such as “Does acting mean mimicking someone or does it mean being a different person in terms of selfhood?” were to be tackled after the theatre visits. The visit to Nach Moskou was not only shocking but also was a nerve wracking experience for many people. Many students who were not students for the acting class left the theatre building in utter disgust during the intermission. The students in the acting course had to bear another two hours of shouting, yelling, and howling from the actors on stage. The play was an adaptation of Chekov’s Three Sisters. It was performed in German and actors kept on adding improvised lines and expression. Russian subtitles were displayed on the screen at the back. An interesting thing that appeared on stage was the intervention of a man with a camera, filming the actors’ expressions closely and especially those actors who were a bit further away from the central action on stage. By the end of the play, we left the hall with headaches and strained eyes. David Levine’s optimism about this play seemed incongruous. In the class discussion that followed the play, many of us argued for the play being a burlesque attempt to portray Brechtian theatre, but we had not seen the play which was to come the next week: Othello. Everyone looked forward to an awe-inspiring production of Othello. The play started off with water on stage and an incredible ensemble starting off the first act of Desdemona and Othello initiating a love-making scene. Gradually other actors on stage took their places and came forward. As the play progressed, despite excellent lighting, acoustics, and set design one thing came out as a very big problem for the audience: the acting. Othello and Desdemona came forward with their rhetorical dialogues, wanting to impress the audience with their authenticity but hopelessly failed to do justice to their roles. 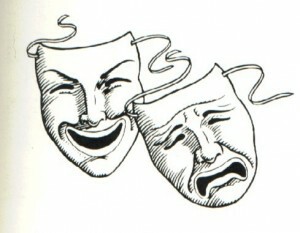 Both of the actors sought the audience’s attention with their constant wailing and desperate cries. They seemed over-directed and even misdirected. The over-acting on the parts of the actors turned the tragic parts into clearly comic ones. The most hilarious moment of the play came when Othello howled and wailed at his loss of trust in Desdemona and in respect the audience sat back and wondered at the stupidity of the actor when suddenly David Levine gave in and broke out into a loud laugh followed by the whole crowd. The follow up discussion of Othello helped us understand several questions about acting and the idea of authenticity present in it. In Nach Moskaou, although the actors overdid the howling they did not lose contact with the audience. They seemed to inhabit their characters as themselves. In Othello, however, it was difficult for the audience to relate to the already distant themes of the play, especially because of the actors’ failure to inhabit their characters. The two persons, the actor playing Othello and the character Othello were both visible on stage and made the experience utterly boring and disappointing for the audience. The acting class is still in search of the true meaning of acting and the quest for this answer is opening up new methods of acting and many more interesting revelations about the right find of acting.